Do you want to take your freshwater aquarium to the next level? This DVD instructs on the intracacies of being a aquatic gardener. Host demonstrates how to use proper lighting, inhabitants, and proper amounts of carbon dioxide to produce a visually stunning and healthy aquarium. 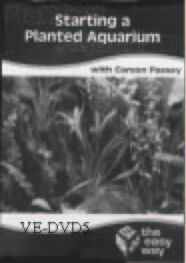 Includes lessons on nutrient rich substrate, aquascaping, pruning and how to effectively maintain your underwater garden. This video will take any plnted aquarium to a higher level.